NVIDIA is today releasing a new graphics card called the GeForce GTX 660 Ti. It is based on the same technology as found on the already-available GeForce GTX 670 and GTX 680 cards sold by Scan.co.uk. These current cards start at £300 for the GTX 670 and rise to over £500 for special-edition models of the GTX 680. Looking to offer gamers more choice at lower budgets, GTX 660 Ti will be available from £250, and this TekSpek will explain how NVIDIA and its partners such as EVGA, ASUS and Gigabyte have managed to reduce the price yet still deliver a compelling graphics card. Though GTX 660 Ti is based on the 'Kepler' technology found in cards higher up in the GeForce range certain architecture cuts have been made in order to reduce the price. The simplest method of describing these cuts is to illustrate them in a table that compares the specifications of the best-available NVIDIA cards. 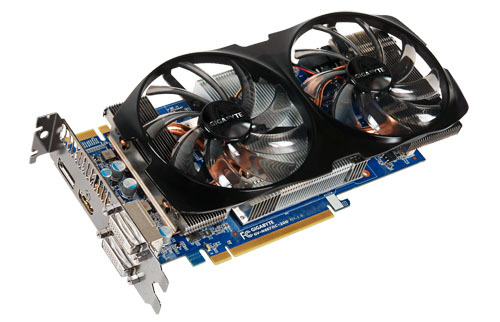 GeForce GTX 660 Ti shares significant commonality with the GeForce GTX 670. It is composed of the same number of shader processors - the performance building blocks of a modern graphics card - and clocks them in at the same speed. The main difference between the two rests with implementation of what is commonly referred to as the 'backend' of the GPU. Here, GTX 660 Ti is hobbled by having to use a narrower memory bus - 192 bits compared to 256 bits - and fewer ROP units. It is relatively unimportant to grasp the fundamentals of GPU design as it pertains to the backend of a card. Rather, what's of more relevance is how it affects performance. The memory bus and ROP throughput affect just how well a card is able to run once you turn the in-game settings to maximum. High-quality graphics and high resolutions make extensive use of memory bandwidth and filtering ability, and this means that the GTX 660 Ti's 25 per cent deficit when compared directly to GTX 670 is sure to have a performance impact. Leading review websites have found that the GTX 660 Ti is, on average, around 20 per cent slower than a GTX 670, and most of this shortfall is attributable to the cuts NVIDIA has chosen to make. But there are obvious advantages to the GTX 660 Ti, too. The power savings that emanate from running a stripped-down backend lead to an average power-draw of 150W, or 20W lower than the £300 GTX 670. And understanding that performance isn't quite as good as the next card up, GTX 660 Ti ships with a lower price point. Providing more choice to its roster of board partners and therefore to gaming enthusiasts such as you, NVIDIA is enabling the GTX 660 Ti to be outfitted with either a 2GB or 3GB frame buffer. There's little to be gained in terms of performance by opting for a 3GB card, according to review websites, so sage advice would suggest picking up a card equipped with 2GB of memory. GeForce GTX 660 Ti performance is also close to that found on competing cards from AMD, notably the Radeon HD 7950, and both offer a decent feature-set and a smooth games-playing experience on a single monitor. They are both comfortably better than the last-generation GeForce GTX 560/570/580, too, and are worthwhile upgrades for any PC that needs increased graphics performance demanded by today's latest games. The GeForce GTX 660 Ti should definitely be on your shortlist if you're in the market for a cool, quiet, power-efficient card that can handle the games of today and tomorrow. Do look out for cards from EVGA, ASUS, Gigabyte, MSI and Gainward in the coming days, and Scan is sure to stock the widest selection of Ti 660-based graphics cards in the UK.